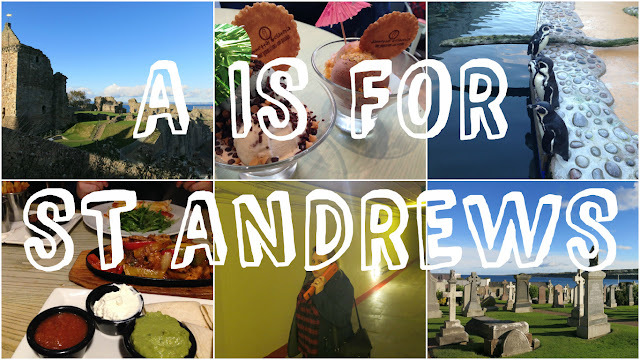 It was Blair's 30th birthday last month, and as he'd taken me away for a surprise weekend when it was mine earlier in the year, I decided to return the favour with a trip to St Andrews. 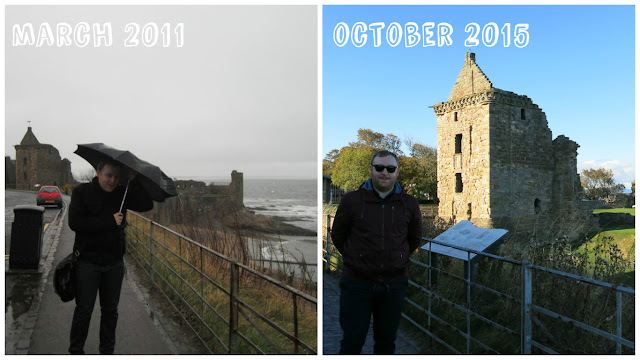 We've stayed in St Andrews together once before - for my birthday 4 years ago - and it's a place we've always wanted to return to (especially as we had terrible weather on our last trip). It's such a lovely little town - in fact if I had to live somewhere other than Edinburgh it would probably be top of my list. We were staying at the Fairmont St Andrews Bay which is just outside of the centre of town. The hotel is huuuuge - it is set in its own golf course, has a pool & spa and 5 restaurants, so plenty of choice for dinner! We arrived on the Friday evening and after checking in we went for dinner at the the St Andrews Bar & Grill. The food was great (spring chicken for me, pheasant for B) but I made a total blogger error and forgot to take any photos - oops! The next morning after an epic breakfast (got to love an all you can eat breakfast buffet) we got into our swimwear and popped down to the pool. If you've read my honeymoon post you'll know that we spent a lot of our time in the pool and steam room/sauna, so this was us attempting to relive those glory days of....emmm....last month. Unfortunately there were too many people around for us to recreate the Great Pool Games of Rhodes, and we couldn't get in the jacuzzi as another couple had taken up residence and we refused to share (we just don't like people, ok?). It was good to get a few lengths in though (so we could feel less guilty about the multiple course breakfast we'd just consumed), and the sauna and steam room sesh was great for my skin! We headed into St Andrews in the early afternoon and after parking up at the beach we had a walk along the coast, passing through the castle and the cathedral. The weather was ace - beautiful sunshine, albeit a bit chilly although we were wrapped up tight in our matching waterproof hooded jackets (such a married couple). After our walk we stopped for ice cream at Jannettas - an absolute essential part of any visit to St Andrews. Seriously the best ice cream EVER. We sat in and had sundaes - after much deliberation I settled on a bubblegum, brookie (brownie & cookie) and nutella ice creams, with Reece's Pieces topping - what a combo! Blair opted for popping candy on the top of his and the waitress commented "reliving your youth?" which tickled me. Happy 30th pal! Next up on our itinerary (of course there was an itinerary) was the St Andrews Aquarium - the first A activity of the weekend. As we didn't go until about 4pm it was dead quiet and, as the front desk was deserted, we actually ended up getting in for free (I did look around for a member of staff but there was no one to be seen, it was v.odd!). As well as the usual fish, seals and penguins you'd expect at an aquarium, they also had meerkats. A pretty weird combo eh? I felt a bit uncomfortable about how small all of the cages looked though, and the fact that it didn't seem like the meerkats had an outdoor area. So probably not something I'd go back to, and pretty glad we didn't end up paying! Dinner on the Saturday was at the Grill House, a cute little Mexican place that I'd read about on my pal Lianne's blog. I went for a classic Mexican triple - frozen margarita, nachos, and fajitas. The portions were huuuuge, and it was pretty cheap too - loved it! On Sunday after breakfast I had a couple of final A themed surprises for Blair. First up was a visit to Scotland's Secret Bunker ("A for secret Agent" - I stole that idea from Kirsty!) - an inconspicuous looking farmhouse near Anstruther that hides a huge secret underground bunker. The bunker was built in the 70's and is where Scotland would have been governed from in the event of a cold war nuclear attack. You can take a look at the command centre where leaders would have strategised on which areas to evacuate after a blast, the dormitories where they would have slept in shifts, the BBC studio where emergency broadcasts would have been made, or eat lunch in the cafeteria that the occupants of the bunker would have dined in every day. It was a pretty cool experience - I couldn't get over how big the place was! After the bunker I gave Blair the final clue - the postcode for (A for) Anstruther Fish & Chip shop! Neither of us have been before and as it's widely regarded as the best fish & chip shop in the UK, it had to be done. I can honestly say that it lives up to all the hype - it was the BEST fish supper I have ever eaten. The batter was perfect - not too crunchy, not too soggy, the fish was melt in the mouth delicious, and the chips were the crispiest chip-shop-chips I've ever had. SOOOO GOOD!!! We ended up sharing a supper between us as we'd eaten breakfast 2 hours before and weren't too hungry, but if/when we return I definitely want a whole portion to devour myself. After Anstruther the rest of the journey home was a bit of a nightmare as the Forth Road Bridge was closed so we had to take a diversion, adding over an hour to the journey time. Asides from the grumpy drive though, we had a great weekend! Our next alphabet date is this month and Blair is in charge of organising date B. I look forward to telling you all about that one, whatever it is!